A mid-Georgian town church built as a chapel of ease to Lancaster's Priory Church. St John's was built in 1754 of sandstone, with the addition of a tower and spire in 1784. The church was built at a time of great prosperity for Lancaster; trade through the port was increasing, and the population was booming. St John's is a good example of a Georgian town church. It is composed of a five-bay nave, small chancel with apse, small Victorian south porch, and west tower. Round-headed windows are used throughout, and the design is very homogenous - and blessedly unaltered by subsequent renovations. The tower is the most striking feature; this was built by Thomas Harrison and comprises three square lower sections rising to an octagonal rotunda in classical style, topped by a small dome and short Gothic spire. 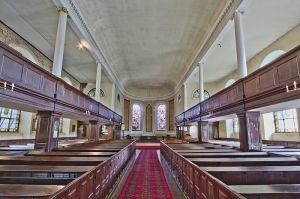 The interior is spacious and open, with galleries on three sides overlooking the nave, which is full of the box pews so beloved of Georgian church architects. The pews each have a number plate, as they would have been rented to church parishioners. The nave must originally have held a three-decker pulpit of carved wood, but this has been replaced with a Victorian wrought-iron pulpit. There is also some very nice Victorian stained glass. St John's is no longer in regular use and is in the care of the Churches Conservation Trust. Please check the Trust website for current opening details. 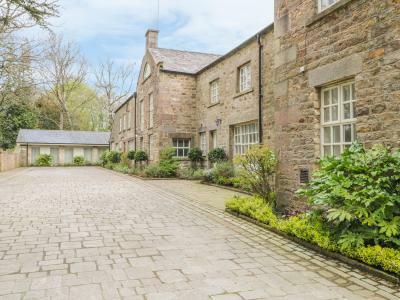 This terraced stone barn conversion is close to the River Lune three miles from Lancaster and sleeps four people in two bedrooms. 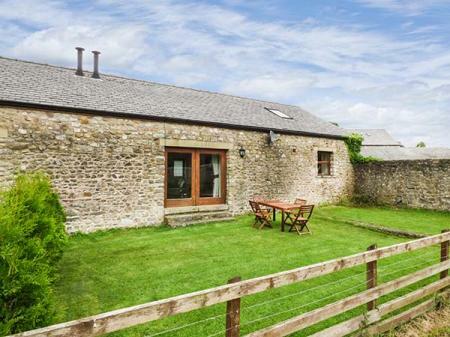 This attached barn conversion sits close to Lancaster and can sleep six people in three bedrooms.